I liked the hotel since everything was cleaned, they had great facilities and the customer service was excellent. We enjoyed the indoor pool and hot tub. It is close to many attractions. Better food options are needed. Service with additional towels was lacking. Overall good experience. The staff was nice and helpful, the rooms were clean. 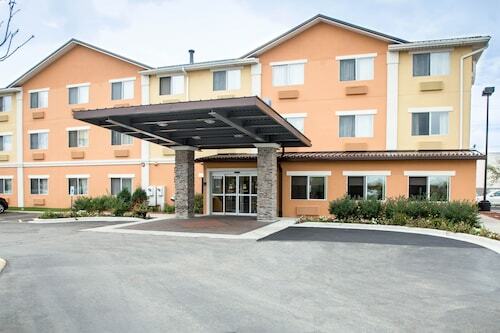 So you're thinking about a getaway to Gurnee? If you want a place to call home that's located near some well-known Gurnee attractions such as Six Flags Great America and Gurnee Mills, just go to Orbitz, choose your travel dates, and voilà! Look through the list of hotels and other accommodations to find those that are located near everything you want to see. There are 194 accommodations to pick from within the larger area if you can't find the ideal place to stay in the heart of Gurnee. Search by filters such as price, neighborhood, guest rating, or popular locations, depending on what's most important to you. We make it easy to find a convenient flight into Kenosha, WI (ENW-Kenosha Regional), which is 15.2 mi (24.5 km) from the heart of the city. Find the perfect flight quickly by using the filters on our site to narrow down your search. Go swimming when you stay at one of these Gurnee properties, appreciated for their pools. What's the Weather Like in Gurnee?